China is quickly becoming one of the most important markets for all the supercar brands. 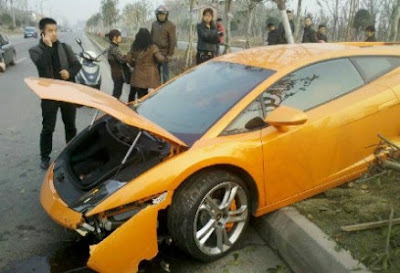 However, it looks like that more and more chinese owners can't handle the high power of a supercar. 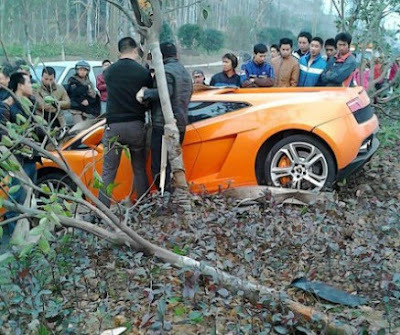 Recently, a chinese man had the honour to become the 1st person to crash a Ferrari F12 Berlinetta (Click here for the post), but this time the accident has involved a Lamborghini LP560-4 in the countryside, not so far from Neijiang. The car was driving at high speed when it spun out and landed into the bushes and trees. 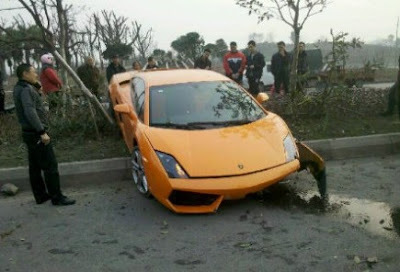 Nobody got injured, except for the Lambo that needs the care of a workshop. A crowd of curious people has sorrounded the area, for most of them might be the first time that they see a car like this, a pity to see it in this way!